Greenhouse hydroponics systems facilitate perfect management of the nutrient dispensing necessary for the health, vigour and growth of plants. 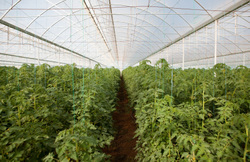 Hydroponics systems offer a reliable way to calibrate and distribute nutrient solutions. Both the rate of distribution as well as the nutrient solutions used can be adjusted to meet the needs of individual plant species. These systems effectively save time, water resources and money. Visit the experts at http://www.cxhydroponics.net for more information. Hydroponics systems vary in their many available sizes, configurations and capacities. There are very complex systems designed for the precision required of scientific research, large scale industrial and commercial greenhouse vegetable and plant production as well as systems designed for home gardening. Determined by the intended use, running costs can be either very pricey or fairly inexpensive. A specialist in hydroponics systems can help you choose the right model for your individual growing needs. Many systems can also be upgraded later on to meet the changing needs of either your home or business. Plants that require very similar amounts of water and nutrients types can be grown in the same system, which permits a variety of plants to be grown together (intercropped) to help save running costs. Whether using a natural or artificial grow mix, hydroponics systems eliminate the requirement for soil in when growing plants. Certain types of systems do, however, utilise inert grow media such as pearlite or rock wool to provide a support structure for the roots of larger plants. Another advantage of hydroponics systems is their ‘closed’ circulation, where both water and nutrients are recirculated within the system. All of the nutrients and most of the water remain in the unit until it’s time for a solution change. Traditional systems using fertilisers and overhead watering use excessive amounts of nutrients and water. Liquids left unused by plants end up on the floor with expenses literally going down the drain. The same concepts apply to home gardeners. Hydroponics systems are engineered to provide nutrient solutions and water directly to the roots of your vegetable, fruit and ornamental plants. Individual lines can feed liquid nutrient water solutions to either a broad area or to individual plant root systems. In traditional soil based agriculture and gardening this precious nutrient/water solution is brought to both the soil and the plants’ roots. If the hose watering technique is used, much water is deposited onto foliage where it can’t reach the roots and gets lost to evaporation. For anyone serious about growing plants, hydroponics systems make a good investment for your greenhouse and home gardening projects as a cost effective and Eco friendly way to save both resources and money.